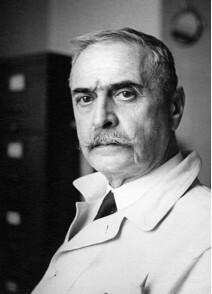 Karl Landsteiner (1868-1943) discovered the Rh factor—a type of protein, or antigen, on the surface of red blood cells—in 1940. Most people are Rh positive. But if a pregnant woman is Rh negative and her fetus is Rh positive, her body may mount an immune response against the fetus's blood and cause harm. With the description of the Rh factor, screening tests to predict such problems, and means of preventing injury to the fetus, could be developed. Landsteiner was a pioneer in the young field of immunology. His interest in unraveling the nature and origin of antibodies led him, in 1900, to discover the major A, B, and O blood groups. For this achievement, Landsteiner was awarded the Nobel Prize in 1930. In the 1920s and 1930s, at Rockefeller, he focused on the chemical analysis of immune reactions. He synthesized artificial antigens by joining small organic molecules, which he called haptens, to proteins of known structure, and showed that small alterations in haptens could produce major changes in antibody production. The underlying idea, that antibodies could be directed toward molecules of known chemical structure, is a founding principle of immunochemistry. This work provided Landsteiner the basis for discovering the Rh factor, with Alexander Wiener. Landsteiner's research had a broad impact on both clinical practice and medical research. Understanding blood groups made possible safe blood transfusions, and laid the foundation for the blood banking technique developed by Rockefeller's Peyton Rous during World War I. Blood typing also allowed the identification of dried blood on criminal evidence and paternity testing. At Rockefeller, Landsteiner's fundamental contributions to immunology informed the work of many researchers, including Oswald Avery, Walter Goebel, and Michael Heidelberger. Landsteiner also made a major contribution to understanding polio, reporting in 1909 that the disease was a caused by a virus that could be transmitted to monkeys. This finding inspired early studies of polio at the Rockefeller Hospital, led by Simon Flexner. Karl Landsteiner was born near Vienna, Austria in 1868. He received his MD from the University of Vienna in 1891, and for the next five years studied in the laboratories of prominent chemists, including Emil Fischer. From 1897 to 1919 Landsteiner held positions at the Pathological Anatomical Institute in Vienna, the Wilhelminen Hospital, and the University of Vienna, including professor of pathological anatomy. Anti-Semitism in Austria after World War I made it difficult for Landsteiner to advance his career, and he left for a post at a hospital in The Hague. Then, late in 1921, Simon Flexner invited him to become a member of the Rockefeller Institute. Landsteiner remained at Rockefeller until his death in 1943. In addition to the Nobel Prize (1930), Landsteiner's achievements were recognized with election to the U.S. National Academy of Sciences and with the Lasker Award (1946).